Adult Size: Size can vary greatly according to the type of habitat and the density of the perch population. A 6-year old perch can be anywhere from 6 to 12 inches long. The average 8 to 10 inch perch weighs about 0.45 pounds and is about 4 years old. 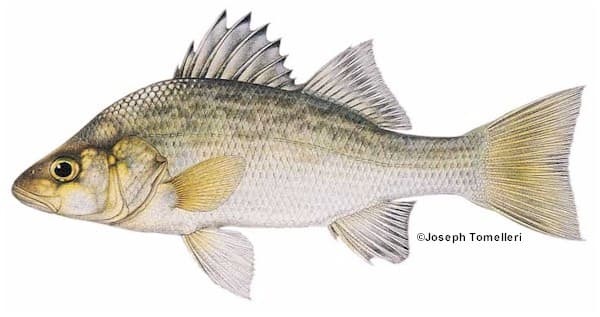 Identification: The white perch is a spiny-finned fish with large, easily seen scales. The fish is dark gray-green on the back and upper sides and the color gradually changes to silver on the sides below the lateral line to white on the belly. In clear waters, the white perch exhibits a bluish tint on the lower jaw.